1879 $4 Flowing Hair, Judd-1635, Pollock-1832, R.3, PR 45 Cleaned. This coin was previously offered as lot 5643 in our 1999 Chicago ANA Sale, where it was cataloged as: "A rare representation of the often misunderstood four dollar gold piece. This example almost certainly traces its origin back to the Philadelphia Mint's official restrike of 425 pieces in 1880. Having unfortunately suffered the ravages of circulation as well as an abrasive cleaning, the surfaces exhibit obvious wear across all of the highpoints and reveal an unnatural brown-gold mien. Heavily abraded throughout, a mark within the central star stands out conspicuously. 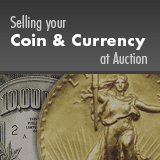 Despite its drawbacks, this is a legitimately rare coin that is always in high demand from gold specialists. We expect this more affordable specimen to elicit strong bids when it crosses the auction block in search of a place of honor within a respected collection."